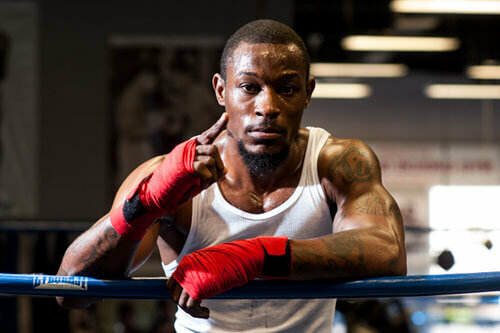 Tyrone Brunson is a professional boxer currently rated #1 by the USBA and is ranked #15 in IBF ratings. Tyrone has been boxing since 1995 at the ABC Gym under the legend Fred Jenkins. Tyrone’s amateur record was 82-12 winning regional and state titles, but never winning a national championship. He would always fall short and would settle for bronze or silver. The North Philadelphia kid would turn pro in 2005 at the age of 20. He would go on and win his first 21 fights with 19 straight KO’s holding the world record of 19 first round KO’s. After losing 6 fights due to Brunson having his foot half way in boxing and the other half in the streets, Brunson’s mind wasn’t focused on boxing. Fast forward to 2016, Brunson signs with King’s Promotions and is focused again. He has put 5 wins together with one of them a 5th round KO over former two x champion Kermit Cintron. Brunson’s goal is to be champion in 2018. Brunson has two beautiful kids, a boy and a girl, Tyrone Brunson Jr, who they share the same birthday Jan 29th and his beautiful princess Tyson Brunson. Tyrone’s trainer is Vaughn Jackson, Andre Thompson and Danny Davis.